The Mars Rovers -- man-made robots with uncanny appeal to the human imagination. 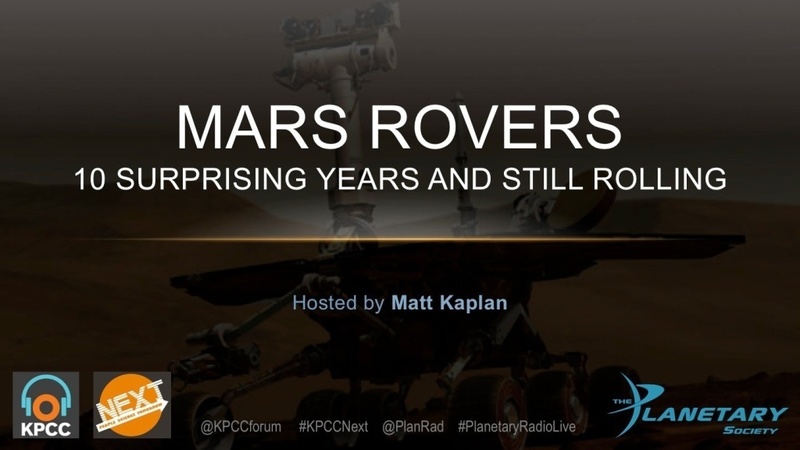 This program is a partnership between KPCC's Crawford Family Forum and The Planetary Society. This program was a partnership between the Crawford Family Forum's science series NEXT: People | Science | Tomorrow and The Planetary Society’s Planetary Radio LIVE. The Mars Rovers – man-made robots with uncanny appeal to the human imagination. January 4, 2004, Spirit fell through the Martian sky, landed on the surface and bounded away, protected by “beach balls” like those that had successfully delivered the Pathfinder lander and little Sojourner rover years before. Just three weeks later and halfway around the planet, Opportunity did the same. She continues her trek today, sending new information about the Red Planet to the waiting scientists on the NASA and JPL teams who launched her. The rovers are arguably among our greatest engineering and science achievements. Even their builders shake their heads as they continue to receive stunning images and intriguing data after more than 3,650 Earth days on Mars - transmitted by a rover with a “warranty” for just 90 days. More than this, Spirit and Opportunity have captivated billions with real time information and images from this alien world. With the mission to find clues to past water activity, they have helped set the course for future exploration, including the successful Curiosity, the Mars Science Laboratory, and the possibility that man may one day travel safely to this elusive planet. To celebrate these ten remarkable years and talk about future explorations, Mat Kaplan, host of Planetary Radio and SCPR’s science series, NEXT: People | Science | Tomorrow, welcomed Steven Squyres, scientific Principal Investigator for the Mars Exploration Rover Project, and Jim Bell, John Grotzinger, and Rob Manning, leaders of the Mars Exploration Rovers team, to the Crawford Family Forum stage. They were joined by Bill Nye the Science Guy and Planetary Society CEO, and the Society’s Emily Lakdawalla and Bruce Betts. Hedgehog Swing, a gypsy swing band based in Long Beach which prides itself on being true to the music of 1930's France and legendary guitarist, Django Reinhardt. 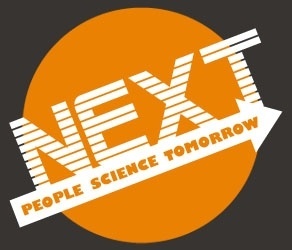 “NEXT: People | Science | Tomorrow" -- the Crawford Family Forum series on the convergence of science, technology and society. Panoramic Camera (Pancam): for determining the mineralogy, texture, and structure of the local terrain. Miniature Thermal Emission Spectrometer (Mini-TES): for identifying promising rocks and soils for closer examination and for determining the processes that formed Martian rocks. The instrument is designed to look skyward to provide temperature profiles of the Martian atmosphere. Mössbauer Spectrometer (MB): for close-up investigations of the mineralogy of iron-bearing rocks and soils. Alpha Particle X-Ray Spectrometer (APXS): for close-up analysis of the abundances of elements that make up rocks and soils. Magnets: for collecting magnetic dust particles. The Mössbauer Spectrometer and the Alpha Particle X-ray Spectrometer are designed to analyze the particles collected and help determine the ratio of magnetic particles to non-magnetic particles. They can also analyze the composition of magnetic minerals in airborne dust and rocks that have been ground by the Rock Abrasion Tool. Microscopic Imager (MI): for obtaining close-up, high-resolution images of rocks and soils. Rock Abrasion Tool (RAT): for removing dusty and weathered rock surfaces and exposing fresh material for examination by instruments onboard.